New York Personal Injury Lawyers | Law Offices of Louis Grandelli, P.C. verdicts and settlements. We put the same skills and experience that helped us obtain those recoveries for every client. Recognized excellence in personal injury. The Law Offices of Louis Grandelli, P.C. has an impressive track record including many cases resulting in verdicts or settlements exceeding $1 million. Our results have been repeatedly recognized in the New York Law Journals Top Verdicts and Settlements. Among the most notable awards were a $16 Million damages verdict received for a Brooklyn resident who sustained a traumatic brain injury in a motorcycle accident, a 10 Million settlement in a truck accident resolved pursuant to a confidential agreement, $9.65 Million for a 26 year old construction worker injured in an explosion, a $6.9 Million award for a financial executive tragically killed during the September 11,2001 World Trade Center attack, $5 Million in a precedent-setting case on behalf of the family of a 43 year old construction worker who fell from a ladder at a job-site, $2.95 Million on behalf of a family whose mother died from the injuries she sustained in a fire due to the landlord’s negligence, and $2,95 Million on behalf of a husband and wife who were injured when their vehicle was struck from behind by a bakery van. 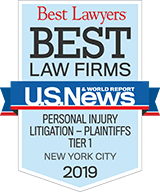 We are proud to have been named as a Best Law Firm in New York City for Plaintiff’s Personal Injury by U.S. News and World Reports for the fourth year in a row. Our reputation in the legal profession as a premier law firm is based upon the significant recoveries we’ve obtained in cases involving serious personal injuries and wrongful death, and our proven track record of success at trial and on appeal. There are many law firms who hold themselves out as “specialists’ who will “fight for your rights,” but when you are deciding which law firm is best for you and your family, the gold standard is a lawyer’s selection by his or her peers for “Best Lawyers in America’ and “Super Lawyers”. Louis Grandelli has been named in “Best Lawyers in America” for the past three years and “Super Lawyers” for the past six years. The Law Offices of Louis Grandelli, P.C. has been named in Best Law Firms – Plaintiff’s Personal Injury for the third year in a row. We have offices in Manhattan and Staten Island. The majority of our clients are referred to our office from people we have helped in the past and attorneys who have chosen our firm as their ‘personal injury counsel” based upon our work ethic, dedication, personal attention to clients and outstanding achievements. We are proud to have been able to help so many people over the decades we have been practicing law. We are also proud to know that so many people were so satisfied that they sent their friends and loved ones to us when those people needed real help after an accident. We can think of no higher praise or better endorsement than when someone we helped trusts us to help the people they care about. We work to earn that level of trust and satisfaction with each new client. We handle all negligence cases involving serious injury and wrongful death with dedication and focus in order to ensure that our clients are adequately compensated by the civil justice system. We realize that there are few things in life more devastating than being seriously injured due to someone else’s negligence or losing a loved one in an accident. We are proud to have been recognized by our peers in the New York State Bar for demonstrating our firm commitment to obtaining justice for those who have been seriously injured in accidents. We strongly believe that much of the advertising by personal injury lawyers is in extremely poor taste and is often done by attorneys who are very good marketers. but have little courtroom experience. It is obvious that the best advertisement any business can have is a recommendation by a satisfied client. Our office has represented a wide variety of clients. including lawyers, doctors, nurses, engineers, construction laborers, construction foremen, plumbers, iron workers, dock builders, steamfitters, electricians, school teachers, and numerous other professions, as well as homemakers. Our goal throughout the years has always been to do the best job that can be done for each and every client who has retained the firm and hope that they would recommend us to their friends and family. For representation that understands your needs after a serious accident has left you injured, turn to The Law Offices of Louis Grandelli. P.C. To schedule a free initial consultation call 212-668-8400 (Manhattan Office) or 718-477-1919 (Staten Island Office) or contact us online.